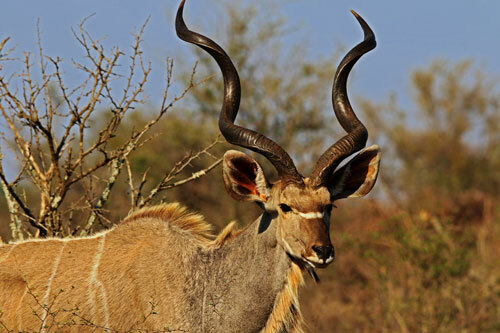 For the best bow hunting bushbuck South Africa offered by the best bushbuck bow hunting outfitters South Africa. 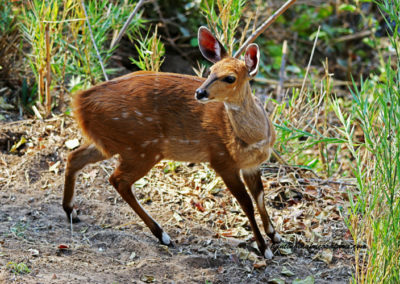 A number of years ago bow hunting bushbuck was not even considered mainly for two reasons: firstly it was thought that bushbuck were only active at night, and secondly, few hunters considered their bow hunting equipment to be adequate enough to reach the distances thought to be required to reach the target. As technology increased the effectiveness of bows, arrows and broad heads, hunters increasingly thought about hunting these nocturnal animals during the day. Bow hunting Limpopo bushbuck happens mainly from a blind depending on the terrain and topography of where the hunt takes place. 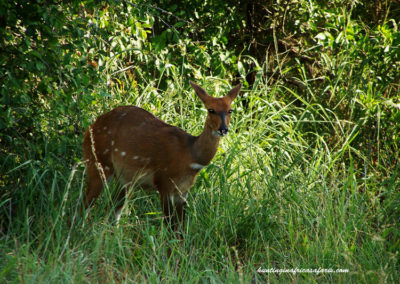 In lower shrub areas, a blind would be the ultimate answer to harvesting bushbuck. If the property has a river front, the hunter needs to wear good camouflage clothing and either sit down and observe, or walk with extreme care. The frame of a bushbuck is such that both mechanical- and fixed blade broad heads can be used. Once the arrow has been released the hunter should be certain about his / her shot. 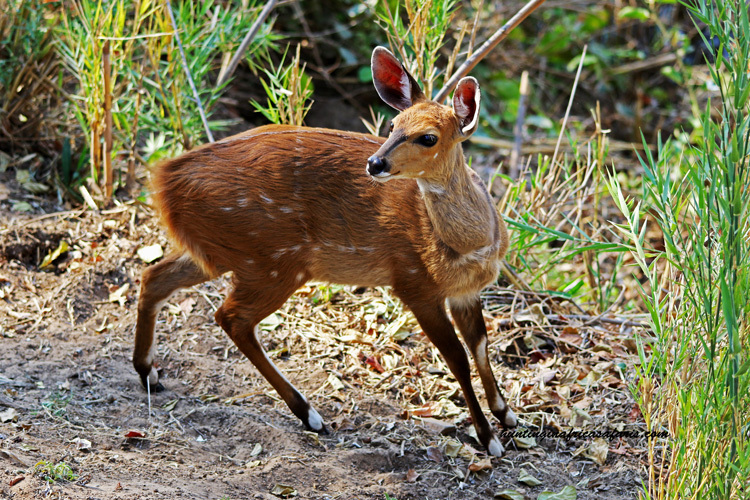 A wounded bushbuck should never be approached without a rifle. Wounded bushbuck often charge when approached and someone unaware of these habits can be hurt severely. 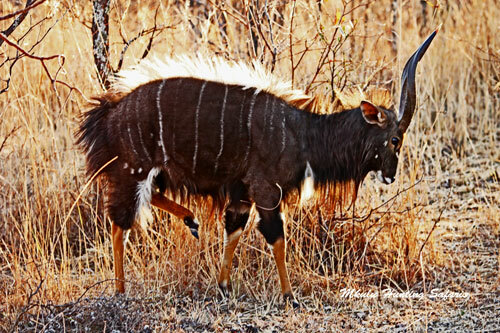 It is a major feat to successfully bow hunt a Limpopo bushbuck during daylight hours. Please remember to bring your video camera along to capture the best of your archery hunting shots on your African bow hunting safari package. 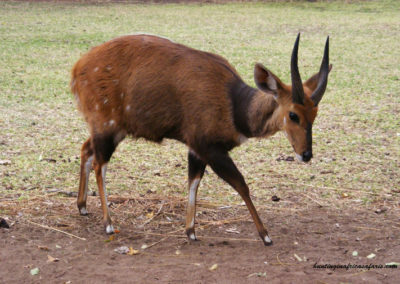 The bushbuck bow hunting prices 2019 South Africa is $ 1 650. 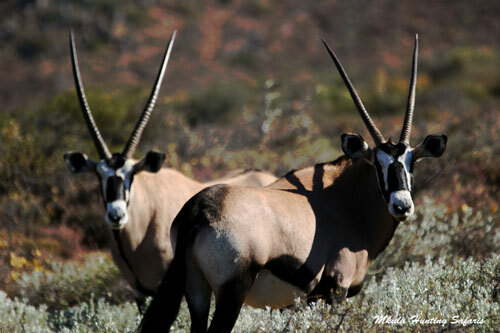 Broad head weight for bow hunting bushbuck in South Africa in grains (gr) – a minimum broad head weight of 75 gr to 125 gr is recommended. A cut on contact fixed 3-blade broad head, Rage II mechanical broad head and a fixed blade 2-blade broad head with bleeders are recommended. You decide which brand broad head you would like to use. 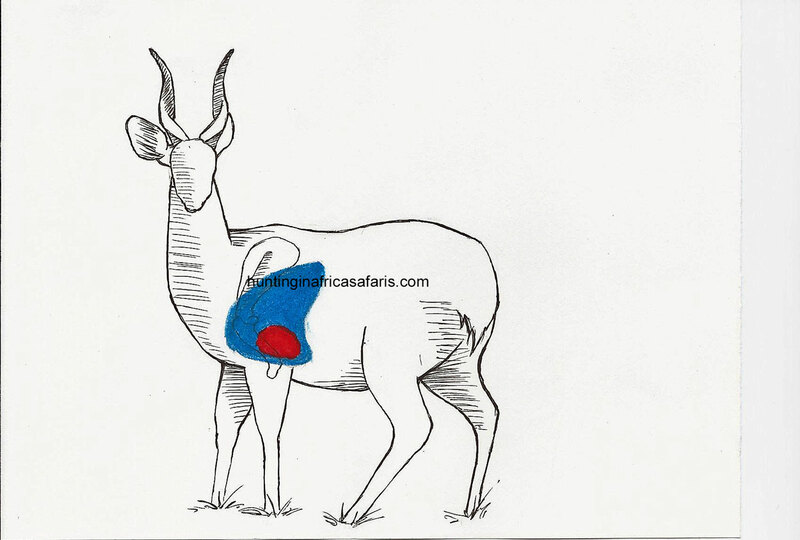 On a broad side shot it is recommended to place the arrow right behind the shoulder of the bushbuck in line with the front leg, one third of the way up from the bottom of the chest to the hump on the back. This shot will result in a high heart / lung shot leading to the bushbuck expiring in the least amount of time. The following tips for bow hunting African lions are done from the perspective of still hunting from a blind. 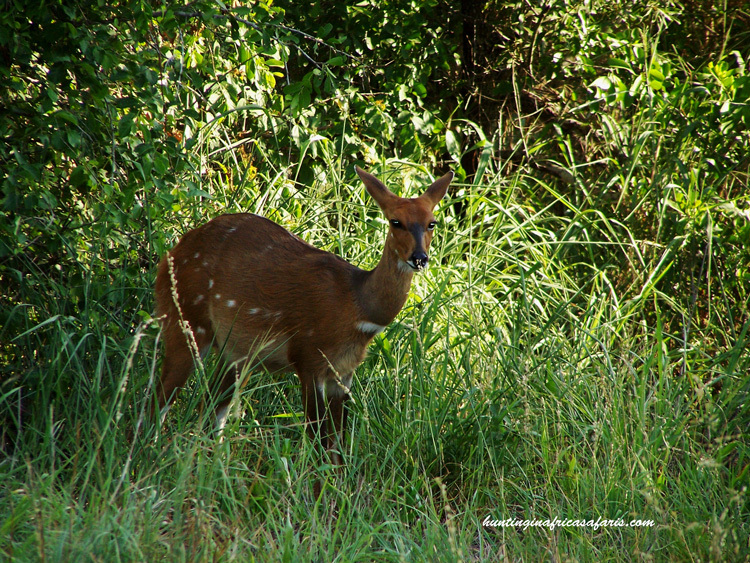 Bushbuck are usually active during the evenings, early mornings and late afternoons. When they come to water they are very weary and care should be taken to move extremely slow with minimal noise. Wait for a prefect shot before releasing the arrow; although these animals are not very big they are hardy. 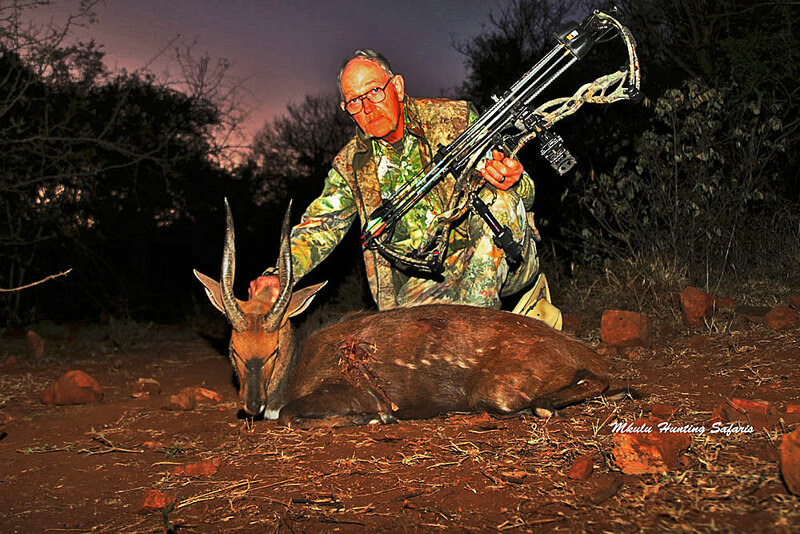 What is the best time of year to bow hunt bushbuck in South Africa – we suggest the best time of year for bow hunting bushbuck would be between May and October lasting to the end of the dry season.